On Tuesday June 6th, Young Sounds of Arizona will close the curtain on our ambitious 2016 – 2017 season. The season included eight performances, all of which were between March and June of 2017, except for the first, in December. With each performance, the students’ intonation improved and their timing grew became more solid. Our students learned to work within their ensembles and to play within the entire group as well. 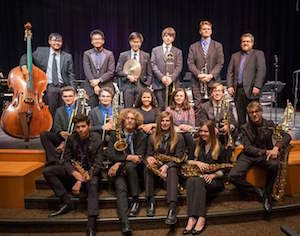 They demonstrated a commitment to jazz and to Young Sounds, and our Directors Andrew Gross and Doug Robinson demonstrated their commitment to our students and the advancement of Young Sounds. This June, we are proud to recognize outstanding Young Sounds students who embody the values of Young Sounds. During the season students worked on jazz improvisation, mastering the swing style, improving ensemble playing, intonation and rhythm. This Tuesday, scholarship recipients will have their moment in the spotlight as we reward their hard work and dedication. So, what does it take to become a Young Sounds scholarship recipient? Scholarships recipients must demonstrate a commitment to their musical studies which includes dedication to rehearsals, performances and special Young Sounds activities. Students must also demonstrate strong technical playing ability and passion for their art. Additionally, scholarship recipients must wholeheartedly understand the value of teamwork. Scholarship winners may apply their funds toward private lessons, college tuition, workshops or master classes. We are excited to announce two new scholarships this season, The Patricia Myers Scholarship and the Tony Ziemba Scholarship. Patricia Myers was family to Young Sounds. She was a passionate and talented journalist and jazz aficionado who consistently supported live local music in Arizona and was a great supporter of professional musicians all over the valley. She believed in our program and in our students. She took the time to get to know them and hear them play. Patricia is greatly missed and Young Sounds is proud to offer a scholarship in her name. Tony Ziemba was a photographer who had a passion for capturing musicians on camera from a very young age. He spent decades behind the lens and perfectly captured many local musicians in their element as well as visiting artists. He was a fixture at local concerts and musicians truly appreciated his work and his generosity as he never charged for photographs. Young Sounds is proud to work with his partner, Elaine Thomas Campbell, to offer a scholarship in his name to help a young aspiring musician.